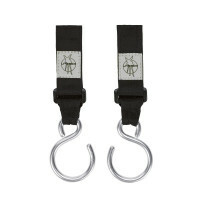 These practical straps with a Velcro® band and snap hooks are suitable for hanging diaper bags on almost any stroller model. 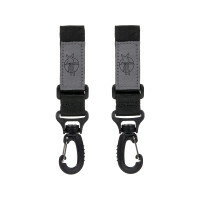 Product information "Stroller Hooks black 2pack"
description & equipment These practical straps with a Velcro® band and snap hooks are suitable for hanging diaper bags on almost any stroller model. Warning: Hanging a bag with excessive weight may cause the stroller to become unstable or in some circumstances tip over. Make sure not to overload the bag.